One of the more interesting companies selling location-based data is Lead Dog Consulting. Chances are if you saw a map in the New York Times recently about the Arab Spring, you probably saw a Lead Dog Map. They specialize in making vector data products in areas that most companies don’t even know exist. Well over the weekend, Lead Dog pushed out over 350 datasets to the WeoGeo Market which are now available to customize and use. If you are looking for data in Libya, Syria, Yemen or even Osama Bin Laden’s compound there probably isn’t a better, more up to date data source than Lead Dog. 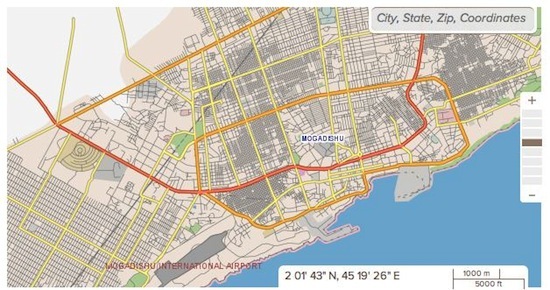 I love their new data in Mogadishu, Somalia which is very detailed and available in just about any vector format anyone might need. If you sell location-based data and want to see your maps on WeoGeo Market like Lead Dog or Pitney Bowes, just let me know and I can let you know how you can get started for free.